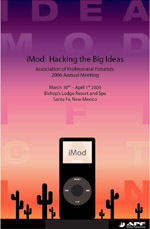 In April 2006, I attended an Association of Professional Futurists meeting in Santa Fe. One presentation on the Complexity Science of Social Diversity really fired me up. Here are my thoughts on how your organization can find its sweet spot and create its own peak future in adverse conditions. I just spent 3 days in Santa Fe, NM at the 4th annual gathering of the Association of Professional Futurists (APF). I’ve been a founding member of APF since 2002, but hadn’t attended one of their annual gatherings since 2004. About 35 people attended, one-half consultants, one quarter working in corporations, and one-quarter students from academic Strategic Foresight programs. The theme of our futures gathering was “Hacking the Big Ideas” for next 20 years. Most of the sessions were led by fellow members on fresh looks at futures consulting methods, but we did draw in outside speakers on Complex Network Theory from the Santa Fe Institute, on Emergent Dysfunctions from MIT, and on “The Science of Social Diversity in Problem Solving” from Los Alamos. I really enjoyed these talks, as I have been writing on these subjects in my own PhD research lately. The last talk by Norman Johnson, PhD on Diversity Science was especially good, as I have been thinking about higher stages of self-organizing systems or what George Land calls mutualism for some time. If we are hacking the big idea on this, it would be that any system, whether a business, an economy or faith community moves toward two extreme states, away from dynamic synergy: (a) either simple selection on one hand, or (b) optimization / standardization on the other. Optimization prevails in mature, stable systems, where the “survival of the fittest” has standardized the market, and efficiency rules. Simple selection prevails in unstable or embryonic systems, where the lack of rules or structure has not provided enough order to create a thriving community. According to Johnson’s research, between optimization and selection, there is a “sweet spot” of wealth, innovation and creativity. He calls this organizational state “synergy,” characterized by dynamic diversity. This makes sense in leadership and organizational theory, that we are looking for a zone where there is a balance between too little choice (Selection) and too much choice (Optimization). On this subject, I just released a DVD called “Mapping Transformation” by Gus Jaccaci. Like Johnson, Jaccaci looks at how living systems grow through three stages: gather, repeat and share. Gather or selection, pulls together a creative idea or economy. Entrepreneurs define organizations during this stage. Repeat is when a company finds success manufacturing and marketing products or repeating service acts. Jaccaci’s stage of “sharing” corresponds to Johnson’s sweet spot of Synergy, where diversity allows a system to withstand shocks, to adapt to changing conditions, to self-organize into new platforms. I am using a new tool in our consulting practice these days, called the “Organizational Culture Assessment Instrument” (OCAI). It helps an organization find their own Synergy or sweet spot, beyond simple Selection or mature Optimization. It is affordable to both small business or small to medium enterprises, and helpful through the post-assessment processes we lead. Sometimes strategic planning will only take you only so far, after that you need to release diversity, creativity, and innovation processes to make sure your organization finds its own “peak” future.